Tess is not as beautiful as her sister Lulu and when Lulu starts going out with Tess’s own not-very-secret crush Charlie, her jealousy takes control. Just for spite, she starts hanging out with the not-so-popular kid, Jasper, who is actually pretty nice, but a loner. She just cannot see beyond the rage inside, not even enough to be nice to her new boyfriend. 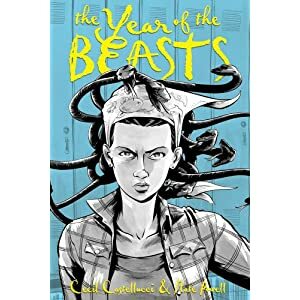 Comics are thrown in and tell the story of her becoming Medusa, for all her jealous acts like ruining Lulu’s cute new shoes, and a strange but alluring Minotaur trying to show her a new path. If she doesn’t either start to appreciate Jasper or give up her jealous feelings for Lulu, tragedy will come knocking on her door. Read it to find out just how it will unfold for lost, angry Tess. I recommend this to all girls and boys who are trying to find a way to be a good sibling or a good boyfriend/girlfriend. You know it just ain’t easy!